This coffee isn’t from The Landmark, but the video is from the Diner and this coffee was delicious. 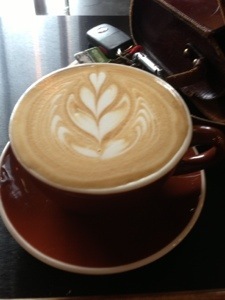 It was from Its Not Just Coffee and it is the BEST and I mean BEST Coffee in Charlotte. The GUT has been extremely lazy. I know you aren’t surprised. It is very difficult keeping up with this thing (excuses, excuses, I know). I recently returned from a roadtrip that was very short. Before leaving, Doug and I indulged in Sunday Brunch at The Landmark Diner. This is one of my favorite staples – nothing makes me happier than seeing women in diners with attitude flying around with plates pretending to be annoyed with people. I came up with the brilliant idea to challenge two of the waitresses to a banana split competition and proceeded to create this unedited video. The competition was fierce and Doug could barely speak – he could NOT believe I actually asked the women to do it. Yup, the GUT is back and it is all about competitions. The banana split was absolutely to die for, I ate every last bit.